Here in Toronto, Canada, there are a number of talented Azerbaijani musicians who teach in music schools in the area. As I met and became reacquainted with them, I thought to myself, wouldn't it be great to gather these people together to perform Azerbaijani music? 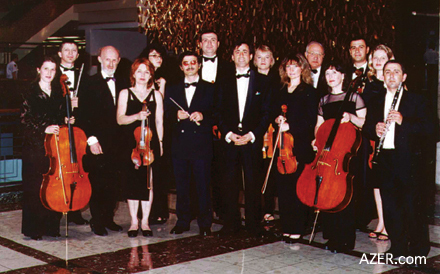 So in June 2001, we created the Silk Road Chamber Orchestra, with composer Adil Babirov and violinist Rufat Amiraliyev. The Orchestra also includes cellist A. Weber, tar player Mohammad Aman, pianist Rena Amiraliyeva, pianist Rashad Feyzullayev, tenor Vagif Karimov and clarinetist Faig Ahmadov. Babirov, who studied composition under famous Azerbaijani composer Gara Garayev, serves as the group's Artistic Director. Ismayil Hajiyev, the former conductor of the Niyazi Symphony Orchestra and the son of composer Jovdat Hajiyev, is our conductor. As a classically trained professional singer, I provide the vocals. Our audiences enjoy hearing familiar pieces like Uzeyir Hajibeyov's "Sansiz" (Without You), Fikrat Amirov's "Evlari Var Khana-Khana" (They Have A House), Tofig Guliyev's "Sana da Galmaz" (It Won't Be Left To You / Your Beauty Won't Last Forever) and "Gamgin Mahni" (Sad Song), Emin Sabitoghlu's "Bu Geja" (Tonight), Asaf Zeynalli's "Olkam" (My Country), and the unforgettable "Ayrilig" (Separation) by Ali Salimi. Left: The Silk Road Chamber Orchestra, recently organized in Toronto. Our classical repertoire draws upon the works of Azerbaijani composers such as Uzeyir Hajibeyov, Gara Garayev, Adil Babirov and others. Our first concert was held November 24, 2001 at the Glenn Gould (CBC) Radio Studio in Toronto. We already have three projects in 2002: a Novruz concert, a broadcast for "Tapesh" TV in Los Angeles and a recording in Baku for Tofig Guliyev's 85th Jubilee. In January 2002, we founded yet another group - the Tabriz Folk Ensemble - which features Mohammad Aman (tar and artistic director), Ramin Shadpour (garmon), Mahmoud (kamancha), Mukhtar Nobary (naghara), Vahid Mehdizade (gosha naghara) and myself as vocalist. Most of our audience consists of Azeris from Iran. An estimated 90,000 Iranians live in Toronto, about 30 percent of them Azeris. In addition, quite a few Persians who have married Azeris as well as second-generation Azeris whose parents emigrated from Iran also attend our concerts. It's wonderful to see the bittersweet joy we bring to Azeris as they listen to this much-beloved music so far away from home. Tabriz-born Yusif Savalan began his professional singing career with Tabriz Radio under the direction of composer Ali Salimi. To learn more about the Silk Road Chamber Orchestra or the Tabriz Folk Ensemble, e-mail Yusif at ysavalan@hotmail.com.